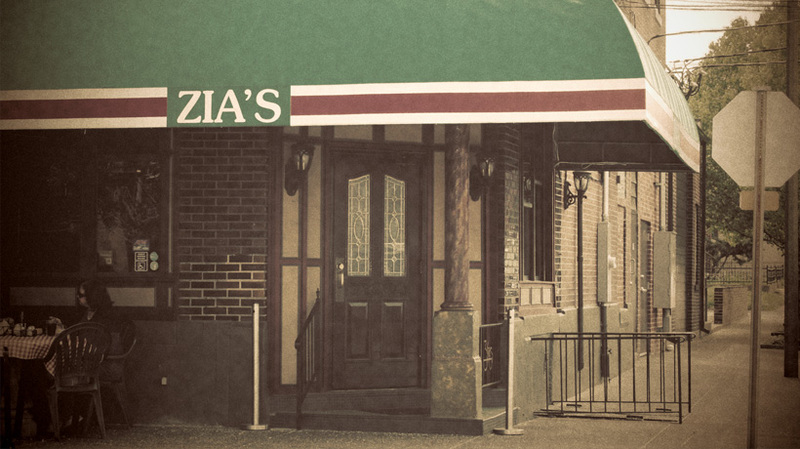 Zia's was founded in 1985, followed by remodeling and the addition of a bar. 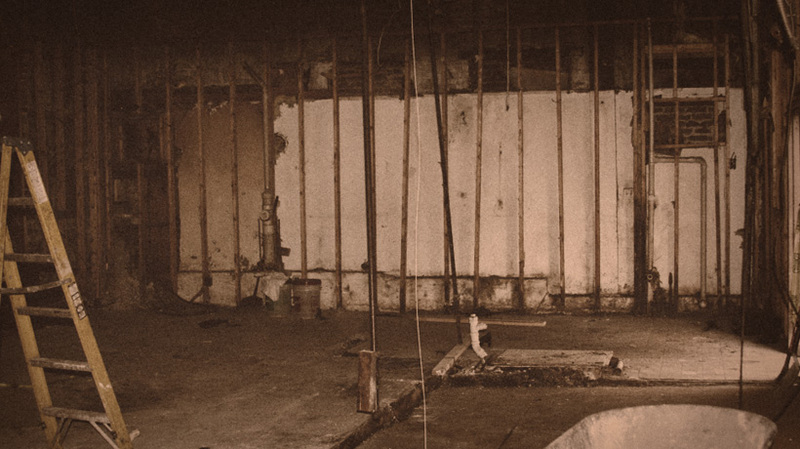 In 1986, the front dining room was completed. 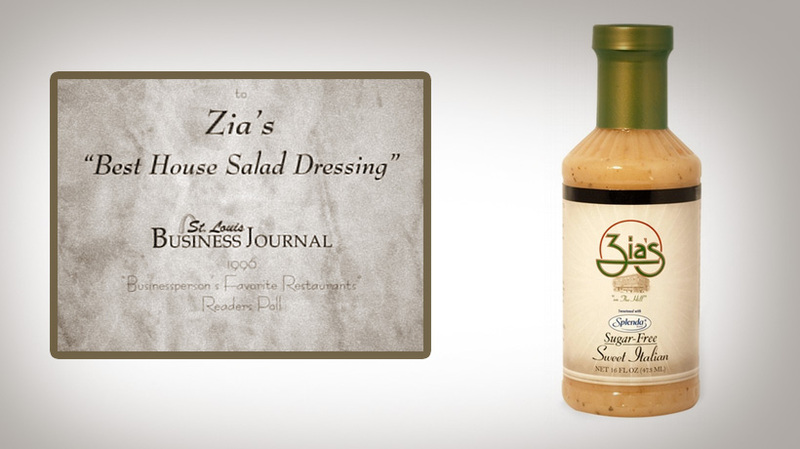 In 1995, Zia's began to offer its amazing salad dressing for sale. it quickly became a local must-have. 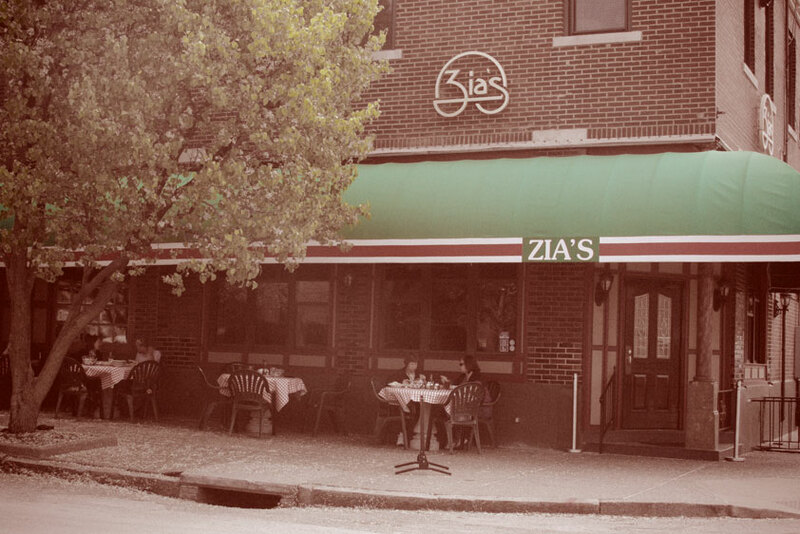 In 2000, the city of St. Louis recognized Zia's cultural and historical significance by formally declaring it an official landmark. 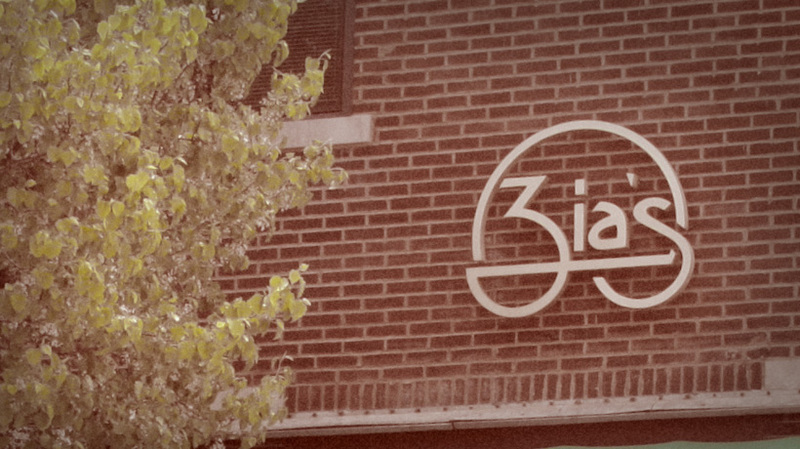 2001 brought Zia's a brand new web presence, complete with e-commerce. We also participated in the St. Louis Art Fair. 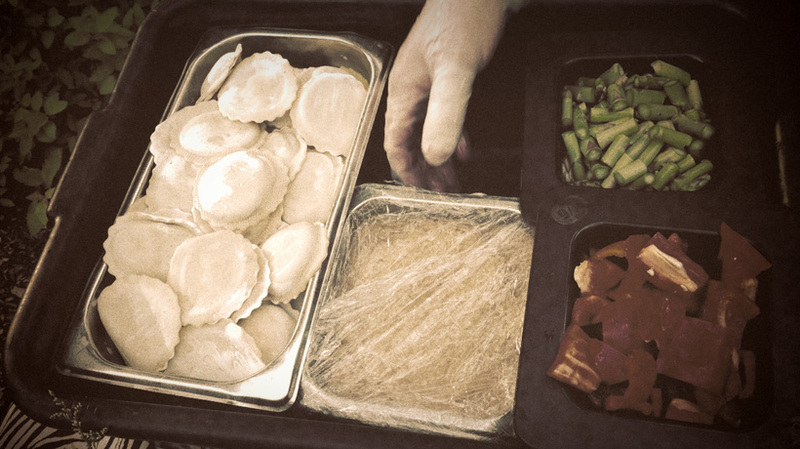 Zia's begins its hugely popular catering division, spreading the joy of Italian cuisine to weddings, corporate events, and more. 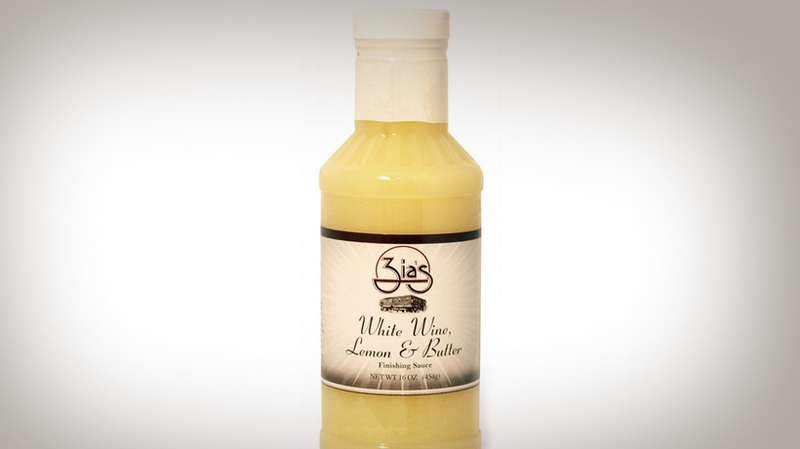 In 2005, Zia's introduced it's now famous White Wine, Lemon and Butter finishing sauce. 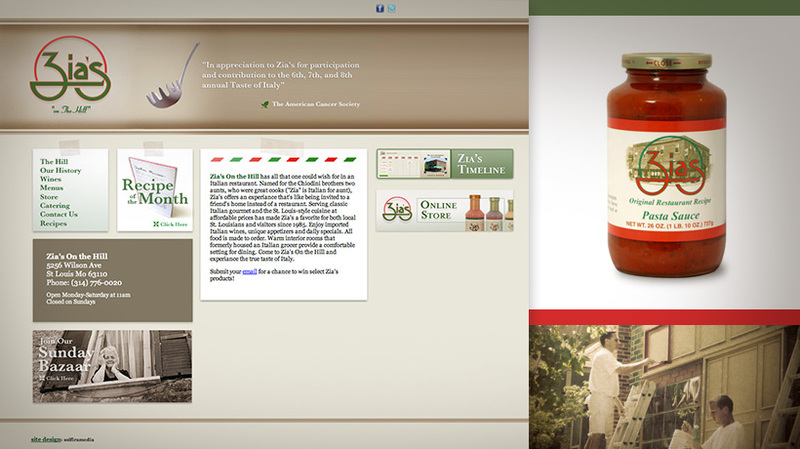 2006 was a busy year, ushering in a new web site, sauces for sale, and some remodeling. In 2009 we had a fire that gutted the whole building. Thankfully, no one was hurt, but it would take time to rebuild. 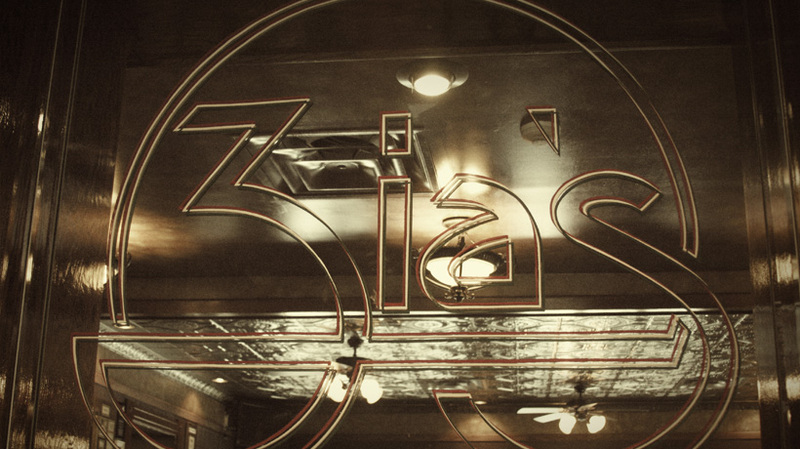 In 2001, after a lot of work, we reopened, bringing Zia's back to life! 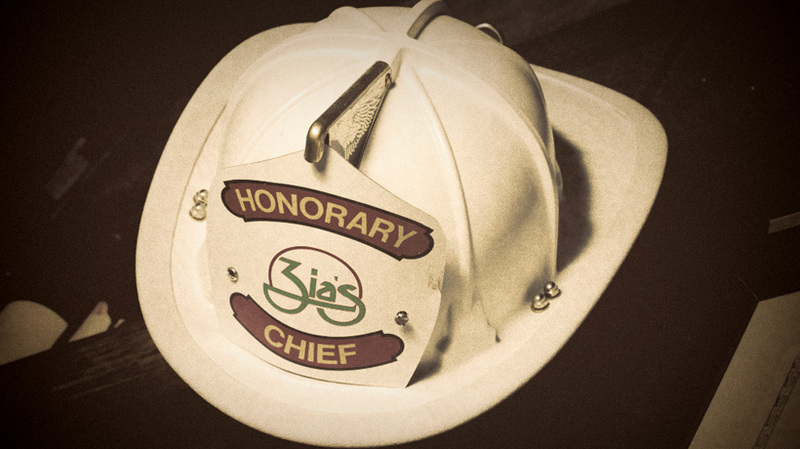 We also held a special Firefighters Appreciation Dinner. Donated portion of month’s proceeds to Backstoppers and life saving foundation for one-year anniversary of reopen from fire. 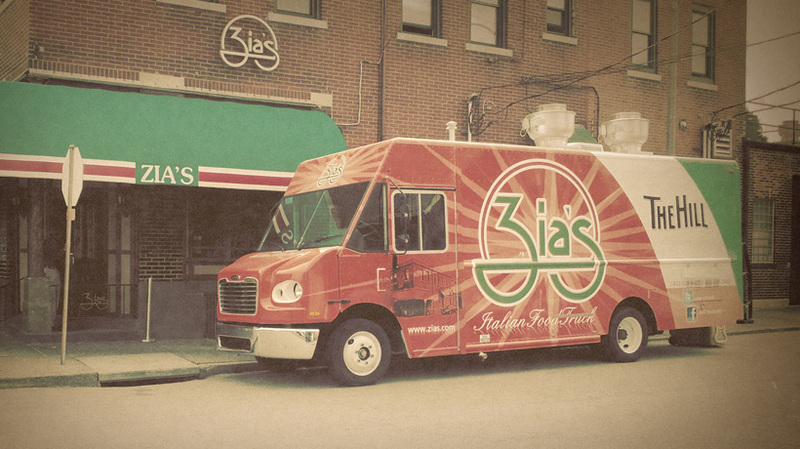 In 2011 we started sending out our food truck to bring Zia's to workplaces and events. 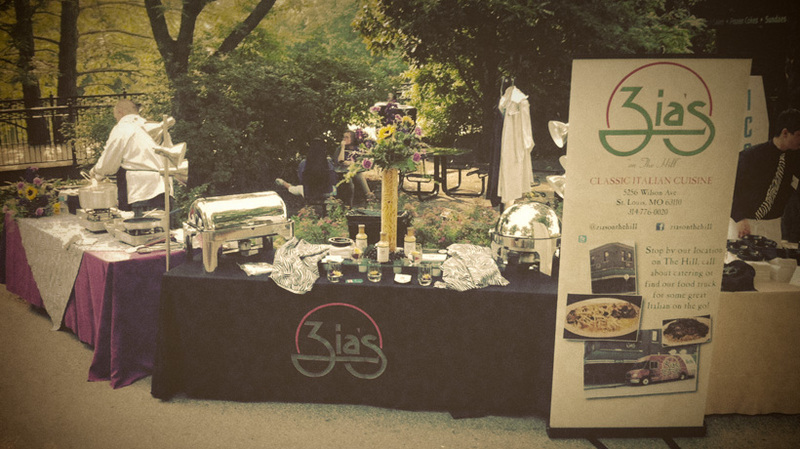 In 2013, Zia's participated in the Zoofari fundraiser. 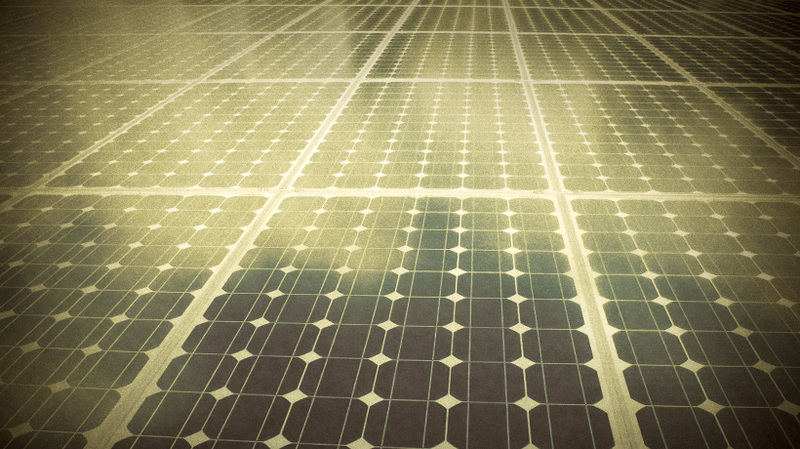 In 2013 we added solar panels to our building, helping us to fulfill our goal of becoming a more sustainable restaurant. 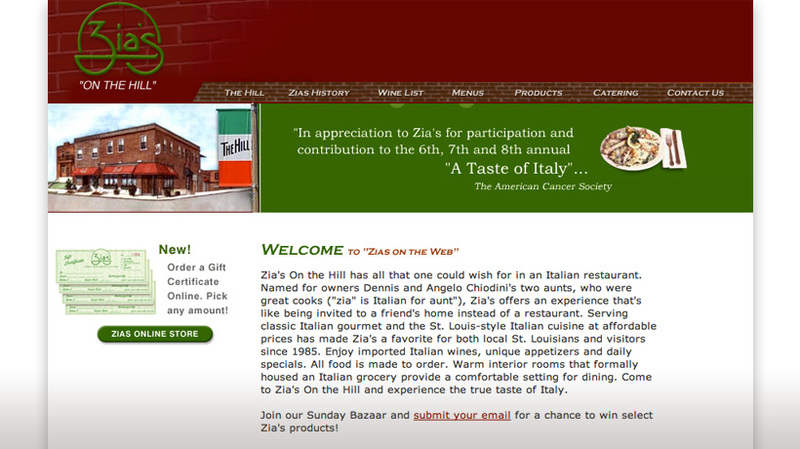 To many St. Louisans, “The Hill” is an Italian neighborhood known for its nationally acclaimed restaurants, specialty groceries and bakeries, tiny “shotgun” houses and fire hydrants proudly painted green, white and red, the colors of the Italian flag. Yet this image just touches the surface, for this 50 square block area in South St. Louis is not merely one of the city’s few ethnic neighborhoods, but among its most stable, tightly woven communities. Though the Hill is no longer the isolated enclave it once was, it has retained a loyalty and cohesiveness that goes beyond the fire hydrants, the annual Columbus Day parade, and the many popular restaurants and specialty stores that dot the neighborhood. 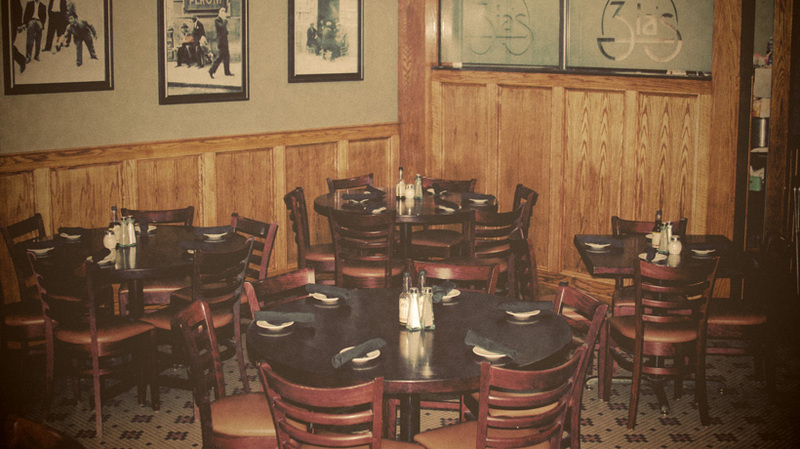 This is still a place where childhood friends meet for lunch, where most people know all of their neighbors and where businesses have been operated by the same families for generations. While the Hill retains is historic ethnic character it welcomes newcomers and visitors as a vital part of its continuity. 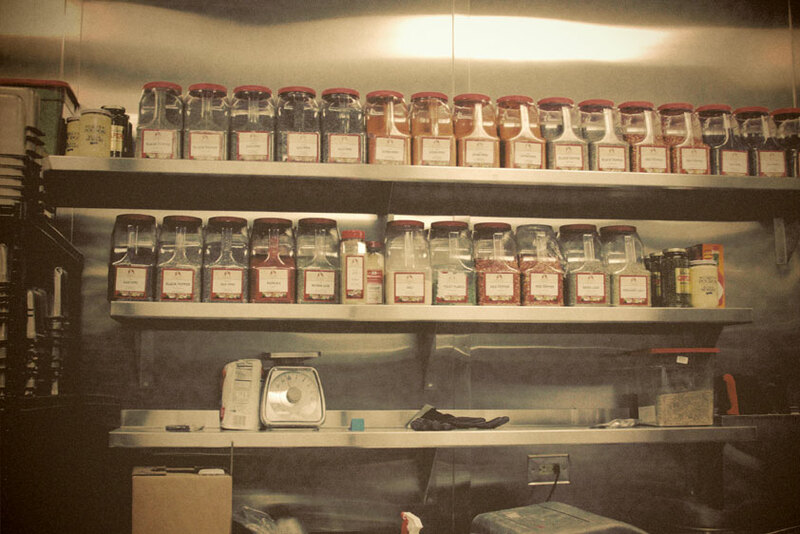 Record setting sales in first 120 days of salad dressing sales…… to go with the introduction of salad dressing. KMOV 4 - Icon on The Hill to reopen soon. The night of Zia's Fire!